Over time, sewer lines can develop common issues, such as a broken or collapsed pipe, blocked or clogged sewer line, or leaking joints in the line, that require professional sewer line repair. A damaged or broken sewer line can be unpleasant for the occupants of any home or business to deal with. That’s why Sunshine Plumbing and Gas provides high-quality sewer line repair and replacement services to commercial and residential properties in Ocala, FL. Our licensed plumbers use the latest tools and techniques to minimize disruption to your daily activities while we provide the high-quality service our plumbing repair company is known for. What Are Common Sewer Line Issues? Sewer lines are often out of sight and out of mind until an issue develops, but the following include some of the most common sewer line issues that require repair or replacement. Clogs can occur for many reasons but they generally show the following signs. This noise happens when air is trapped in the line and works its way back up to the toilet. It usually means there’s a blockage in the gas venting system. FOG (fats, oils and grease), hair, paper products, and other and non-flushable items are common culprits behind a slow-flowing drain and clogged sewer line. Food residue, FOG, and other gunk regularly builds up around and/or in kitchen drains, causing foul odors. If the residue builds up inside the sewer line for a long time, sulfide gas is produced as the organic matter decomposes. This gas gives off a rotten-egg smell. A broken sewer line usually features one or more of the following symptoms. Unless your home or business is connected to a private water well, a higher-than-usual water bill typically signals an issue with the sewer line. Check for leaks caused by damaged seals around pipe joints. If you see puddles of sewage or water in the yard, and there hasn’t been heavy rain or flooding recently, it’s probably a broken sewer line. While sewage backup can indicate a clogged line, it’s more frequently associated with broken lines. Waste often backs up into a toilet or basement, but it could also back up into any drain attached to the plumbing system. What Sewer Line Services Do You Offer? When there is a sewer line issue, you need timely and efficient repair or replacement services. We provide all-encompassing sewer line repairs and replacements in North Central Florida. As a business owner, the last thing you want is a prolonged disruption of operations to your company. When you contact Sunshine Plumbing and Gas for commercial plumbing services in Ocala, we work quickly to fix any problem in the plumbing system. 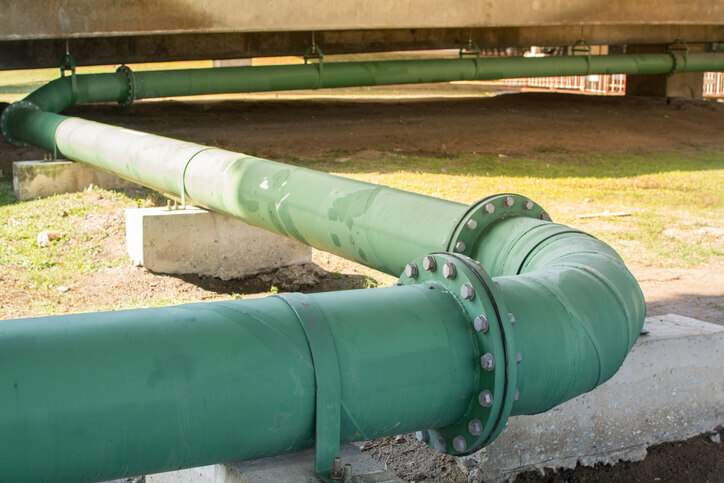 The traditional and trenchless methods are available for commercial sewer lines, and we can inspect your property and help you determine the best option. Also called cured-in-place-pipe (CIPP), the trenchless method of sewer line repair consists of making small access holes at the beginning and end of the damaged pipe. The new sewer line is then pulled through the existing pipe and connected to existing, undamaged pipe. If the sewer line to your home requires replacement, call Sunshine Plumbing and Gas for high-quality residential plumbing service. We use an in-line camera to inspect the line and find the root of the problem. Replacement is done either traditionally or with a trenchless method. The choice of method depends on the condition of the sewer line, how the lines are set up, and the home's location. Initial diagnostic plumbing tests for the sewer system will help us determine if and when a traditional sewer line repair is required. With a traditional replacement of sewer lines, a backhoe digs up the area around the sewer line and refills the area after the new line is installed.